Through rushes and through reed. On the snowy white, shimmering stead? His face like the sun so bright. Giving Challenge Noon to Noon Tuesday 9/20 – Wed 9/21 LIVE NOW! From Noon to Noon September 20th to 21st, our school is one of the 449 non-profits in the Sarasota area qualified to participate in the Giving Challenge, through the Community Foundation of Sarasota County. During this time, we are asking for you to help support our vision of providing children with a developmentally appropriate education and real childhood experiences, by making a donation, and/or sharing our donation page with family and friends. The Giving Challenge is a 24 hour online fundraising opportunity for non-profits in our community. All donations are matched! 2:1 for new donors, and 1:1 for returning donors. All funds donated to Mangrove School will go directly towards programs for children. Click donate now and enter your information to complete your secure donation. The link above will go LIVE on Tuesday 9/20 at Noon, and will remain available until Wednesday 9/21 at Noon. With the generous matching by the Patterson Foundation, your $100 donation could become a $200 or $300 donation to our school! Additionally, there are tons of matching grants and prizes to be awarded during the challenge. For example, the non-profit with the most unique donors can receive an additional $7000 grant! With your help, perhaps we can win this grant! This event is completely online, allowing anyone, anywhere, to donate. Last year we raised over $14,000! 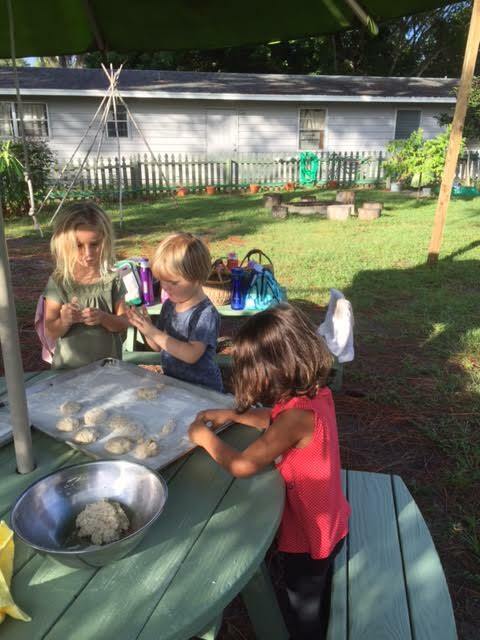 Be the one to support developmentally appropriate education in the Sarasota area! Be The One To Support Our School! The Autumn Equinox Festival is the first festival of the school year and it is held on the first day of autumn – when day and night are perfectly balanced. 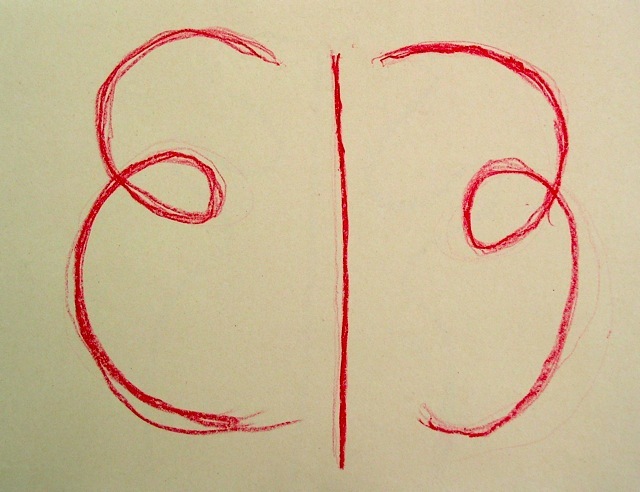 This equilibrium also represents the duality of light and darkness that exists within human beings. This festival honors the courage and strength in each of us, as we face this part of the year, of longer nights – a natural time of turning inward, reflection, and facing our own darkness. This is traditionally pictured as the brave warrior in the act of subduing a dragon, which represents the dark side of human nature. For the children, this message is not overtly stated, but rather, this time of year is filled with stories and songs of the brave and true. The children learn that with great valor, dragons can be beaten. For our festival, the Grades students perform a play for the community that depicts a person summoning the courage to beat the dragon who is frightening their village. Afterwards, the community enjoys a potluck breakfast and a few fun activities before the students return to their classes to complete their school day, with a regular dismissal at 1:30. When you arrive, please meet at the early childhood playground, near the basketball court. We will have tables set up for a potluck breakfast, and benches and chairs set up for watching the play. Grades children will go with their teachers to get into costume at 8:25. The play will begin at approximately 8:45, and is about 15 minutes long. After the play, please stay to enjoy the potluck, while the children test their strength and courage in some fun and engaging games. One of our past sweet gnomes! Thank you so much to those who have offered to help with set up and break down! A few more hands would be quite helpful. Set up for the play will be at 7:45. Break down approximately 9:45. 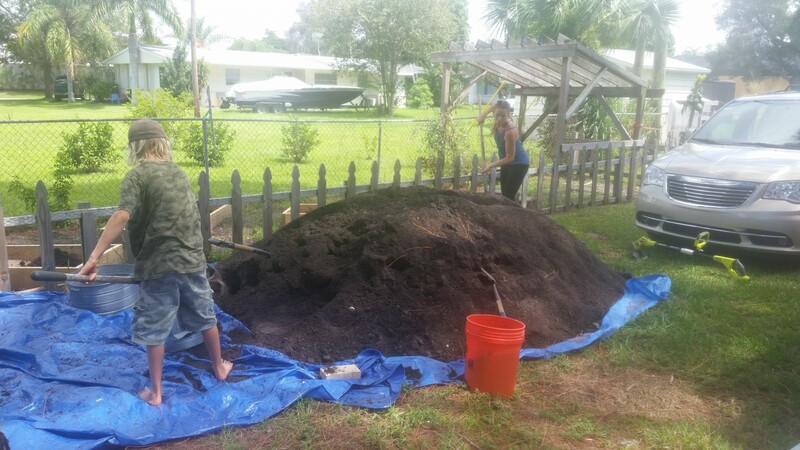 Please email mangrovesarasota@gmail.com if you are able to assist. We had a beautiful start with your wonderful children! The children started making friends immediately and it is amazing to see how they already take care of each other. Our circle time has consisted of ocean themed songs and rhymes, which most of your children know by heart already. We are getting used to our daily rhythm and rituals and are looking forward to them every day anew. We did our first water-color paintings, made little shell boats and last week plant dyed silk for a longer fairy project. They listened to the story “George and the Dragon”, and as soon as it was over, they immediately began gathering props and acting it out. We have had a few different puppet plays which shared the themes of “making friends” and “sharing a house”. These are therapeutic stories and often used in Early Childhood to help with transitioning from home to a school setting and all the challenges that come with this. I hope I will see many of you at our Autumn Equinox Festival on Thursday. Even if Thursday is not one of your child’s attendance days, you are still very welcome and encouraged to come. Please always feel free to text or e-mail me with any questions you have. Some of our Seahorse and Starfish children grinding grain to make flour. The Starfish Kindergarten children have been working very hard on their gnomes. There have been small and large gnomes made by all the children. It is amazing how well they have all taken to sewing and some are even creating their own gnome patterns. 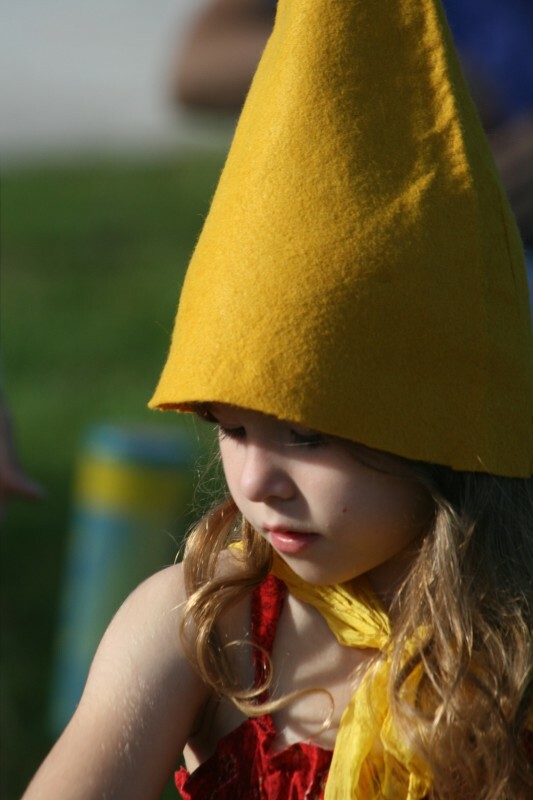 Soon we will be working on gnome hats for each of the children, per their request. The class has come together rather quickly and they are learning how to be with each other in a fun and respectful way. Our first circle was about honeybees and had a counting rhyme, “This Old Man”, and a letter song about the letter A. We drew the letter A and walked it, as the children thought of different words that started with an A. They thought up quite a few. The circle we are doing now is about Michael, “strong, pure and shining bright” and we moved on to the letter B. We drew the letter B in the sand and thought up B words to sing to the tune” Do You Know the Muffin Man”? Our circle also included a skipping song that they laughed and enjoyed very much. The first week we had a puppet play about a little girl and a rose that Ms. Birte and I put on for the children. The story was about a little girl and how she needed patience to wait for the roses to open as they are more beautiful that way than trying to make them open before their time. I have read “The Pancake Mill” and “Michael and the Dragon” to them and they have really enjoyed it with not a peep as they hear of George’s battle with the dragon. 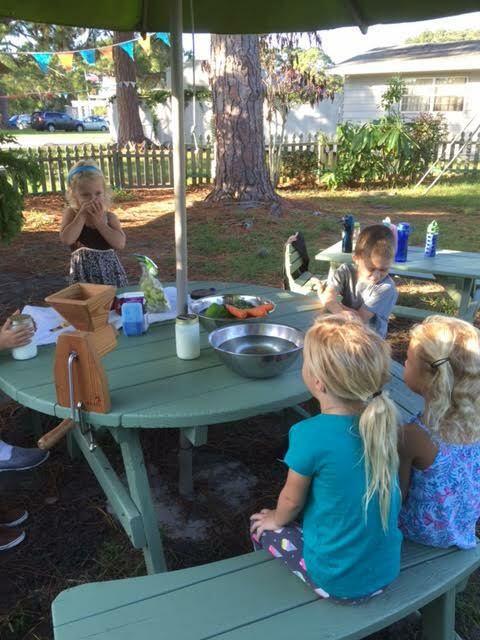 We have been with the Seahorse class outside in the earlier part of the morning grinding rice into flour, cutting vegetables and fruit, and making bread. Thank you so much for your lovely donations, the children love to see their fruit and veggies that they have brought in the bowl at snack time. I look forward to a wonderful year with your children and have some exciting and fun projects we will be working on. Some of these will be candle dipping, lantern making, and wood working. If you have a talent that you would like to share with the class please feel free to contact me and arrange a time to come in and share. Veggie cutting time in the Early Childhood! One can hear excitement streaming from the First grade classroom every day. There has been pure joy being expressed from your children as our eyes, minds, hearts and souls have been experiencing the world around us anew! Our excitement lives in our Form Drawing. Form Drawing is the foundation linked to all subjects (reading, writing and arithmetic/geometry, as well as soul work), and begins with straight lines and curved lines. We will continue this experience throughout our year, and it will stretch and weave into the following years of our lives to come. Every day we work with numbers and are quite busy counting as we move with a full rhythm about the classroom. Currently, our goal is that everyone can count backwards from 100 with a rhythmic, fluid confidence. This seems simple. As we climb higher with the numbers, however, it takes quite a bit of will to remember which number we are on and what comes next. We are laying the foundation of a strong sense of number for our first arithmetic block and beyond. We will continue to have counting be a part of our everyday journeys. Rich stories have been shared with your children. After a new story is told, the next day we revisit the story told the day before, each taking turns to recall what lives with each one of us. Listening to how words in a story are pronounced is a wonderful way to become great spellers. Stories are woven into each week and are sometimes told daily. The First graders are very much looking forward to their début at the Autumn Equinox play. You may have been hearing their lines that they will share with the community this Thursday. In addition to our Handwork and Eurythmy classes we look forward to the wood flute and French. We will be found living in the first grade room or outside, laying down a glorious foundation for the LOVE of learning! An example of a first grade form drawing. The beginning of the school year, for our second and third grade class, began with joy and friendship. Many new and happy faces joined us, so we set about introducing class rhythms and work habits. Because we have the benefit of a native German speaker in class, Ms. Stefanie begins each day with some basic German conversational elements and German songs accompanied by a lively German game; followed by mental math (so far addition and subtraction up to 20). Ms. Yolanda joins us after those activities and we transition into our Main Lesson block (which the main focus right now on Language Arts). We are also learning about how we can use our golden manners and exploring what makes us thankful. Please ask your child about the “Bag of Nails” and “The Little Zebra” story; the first was about how words can make a lasting impact and the second one was about being patient. Also, ask your children how Sam and his friends explain how the children can practice not interrupting or showing off. With this age, the children are able to take on practical household chores, such as laundry folding – which we are also practicing in class. This task gives them a sense of contributing to their family and the children take pride their work. 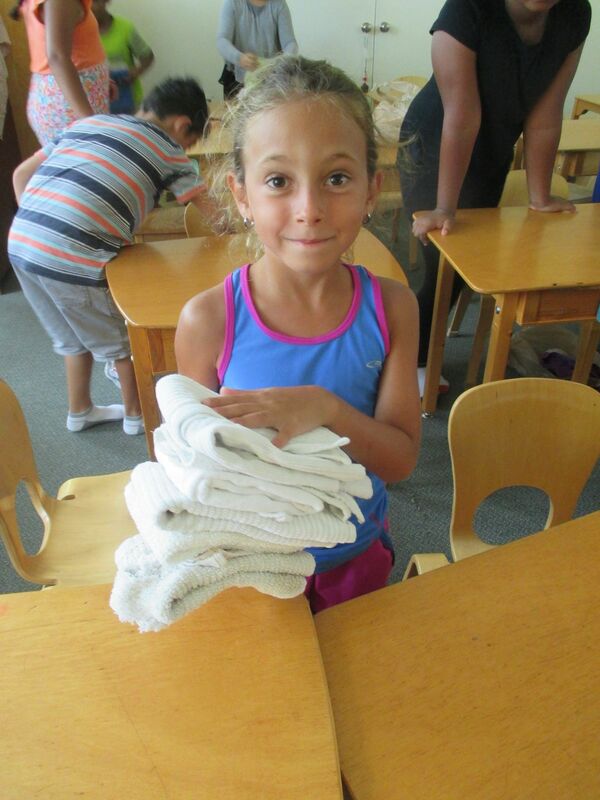 We thank our parents for sending in clean laundry for the children to fold. More ‘Earth Skills’ will be added to throughout the year and we encourage families to allow children to practice these skills at home. 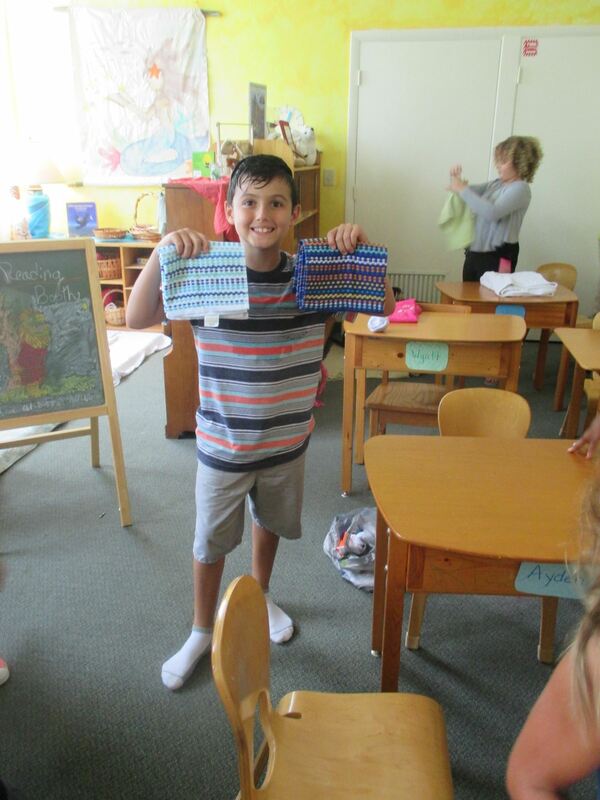 Laundry folding in Earth skills class. We are noticing that there are two groups of writers and readers emerging. With such a span, having two teachers in the classroom provides plenty of support to assist and guide each group. Whether it is working one-on-one with helping them write a word or guiding them through paragraph construction, we are able to accommodate. Rich stories, such as “Two Goats”, “The Rat Catcher” and “The Enchanted Kingdom” are also in full bloom along with wet-on-wet painting and a special snack each Wednesday. Form drawing is also being practiced with a new breathing technique accompanying each stroke of their pencils. This helps to slow them down and make their scripting more deliberate and clear. Math is practiced bean bag style, with ready hands and minds to answer the quick mental math question but also in written form through some basic math practice sheets. Just a reminder, on September 29 at 7:30 pm, we’ll come together as a community for the 2/3 Class Parent meeting. We’ll discuss upcoming class events and discover how we can all work together for the benefit of our children. The new school year has begun splendidly, with new students welcomed into class with enthusiasm and grace. Our first block started us off with an immersion in Local Geography. At this age the children are developmentally ready to orient themselves in both space and time. We begin with a very small scope, and then widen our perspective, gradually awakening the children to a new sense of space and relationship to the physical world. Learning ones local surroundings is an important way to unite the child to earth, and cultivate a feeling of belonging. We started with simple map making, from a bird’s eye view – of our bedroom. A familiar small space is a nice introduction to this new perspective of drawing, which requires some imagination! From there, we mapped the classroom, in which we also introduced how to scale a map, then our campus, and then a map to our own homes, which collaboratively on our chalkboard gave us a good sketch of the area from Englewood to Downtown Sarasota. We then explored maps of the city, then the county. We studied the four cardinal directions, drawing our own compass rose, and by becoming human compasses – turning north, south, east and west; then adding in primary intercardinal directions as well. We began working with a compass in a simple way. We will revisit this activity later in the year in more detail with an orienteering course in cooler weather. We also learned how to navigate when one doesn’t have a compass. We talked about landmarks, and added some to our maps, then moved onto physical features of Sarasota, particularly bodies of water. We discussed how water flows through the state, pointing out – “Geo-graphia” – which essentially means “earth writing” – is the natural boundaries that are carved out by water. For the second half of the block we will move on to Cultural Geography – how people have used the landscape to live, and how the features of this location influenced their habits and way of life, from prehistoric times until now. We will continue to look at the maps of our area over time, to emphasize the changes that have occurred. 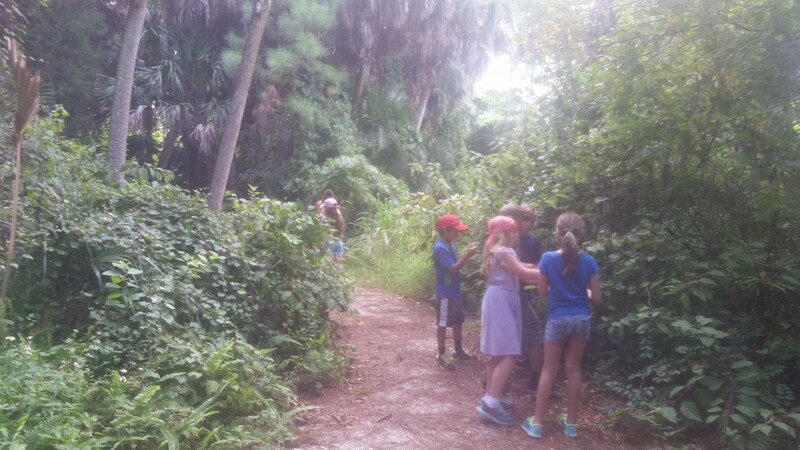 This study will include two days with the Public Archaeology lab over the next two Fridays at Phillippi, as well as a trip to Spanish Point, date TBD. This block has been a wonderful way to ease them back into school – by reawakening their work habits, stoking their curiosity and natural desire to learn, and incorporating foundational work (math, reading, and writing) in an organic, dynamic way. Each day we use the first half hour of the day for recitation – reciting tongue twisters (to wake our mouths up), or a poem related to our block of study, during which the emphasis is on enunciating and speaking at a proper volume – tools helpful in other areas, such as spelling and drama/public speaking, respectively. We also sing – we are currently working on a four part song, with four unique parts, which is a huge leap from last year when we did only two part rounds, as well as a song for our play, on Thursday. After these activities we do a complex mental math problem or two, orally, such as several step number journeys, halfway numbers, or guess the number I’m thinking, which can have a very large range, say for example, between 0 and 10,000 and beyond. (They have to ask yes or no questions regarding the qualities of the number to figure out the answer) This helps solidify their sense of larger numbers. I love to stretch their capacity for numbers by engaging them in “fun” word problems or games, so they enjoy themselves while practicing these skills. We will also “dissect” a sentence or two, sometimes a paragraph, into parts of speech and correct the grammar. We practice commonly misspelled words over several days of the week. In an effort to shake out the cobwebs of summer, we have also done some bean bag work with the times tables. After this first half hour, we move into the main content of our block, energized for the rest of the day ahead. In addition to the main block, we have also enjoyed eurythmy, handwork (cross stitch), Spanish, wood working, water color painting (veil painting), sculpture, violin, and form drawing. We look forward to French beginning next month, as well as a few specialties that will be offered as blocks over the year. We have started reading a book together, as a class, and we do written mental math practice sheets several times per week – to keep our basic math facts fresh, to practice doing 2 digit problems without needing to write it out vertically to carry or borrow, and to encourage a flexibility in our thinking of numbers by knowing our operations both backwards and forwards – so, 8 + 8 = 16 and 8 = ____ – 8. We have also begun a study on medicinal/ wild edible plants, which is currently focused on useful native plants, (again, this sense of knowing one’s surroundings is a wonderful way to foster a connection to the world) and we will be harvesting some to create a few products to present at the Local Artisan Outdoor Market in December. So far we have made an insect repellent using beauty berry infused water. The students harvested the beauty berry plants, created the infusion, then made the insect repellent using natural ingredients. Beauty berry is a nice plant to start with as it is easily identifiable. You cannot mistake its beautiful berries for any other plant! Your children are wonderful beings, and I feel truly honored to spend this time with them, exploring the world and its ways, which of course also includes social relationships. The verse below has a powerful message for this age group- this is the age when a desire for special friendships begins to emerge, but, like with any life skill, at first they can be clumsy at times and feelings can get hurt. The last is narrowest: Is it kind? I have a lot of plans for the year for these dear children to continue to cultivate their love of learning, and I look forward to sharing them with you all at our first parents meeting on Thursday, September 22, 2016 at 2 pm. Harvesting Beauty Berry plants for our insect repellent. We can make anything we need! 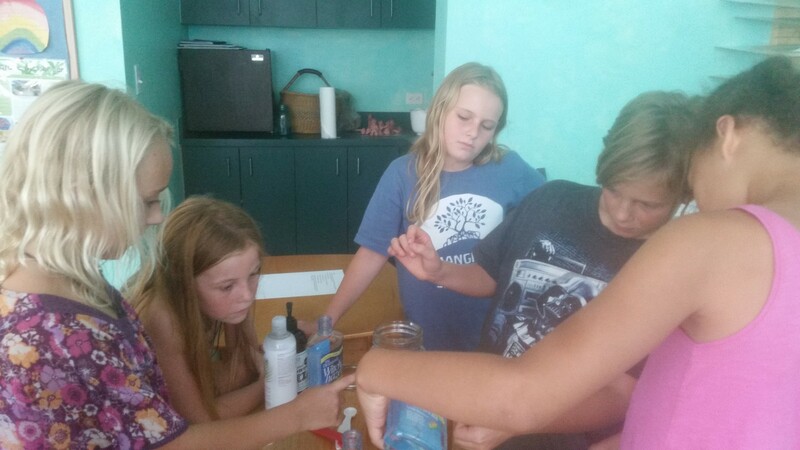 Preparing insect repellent together in our classroom. 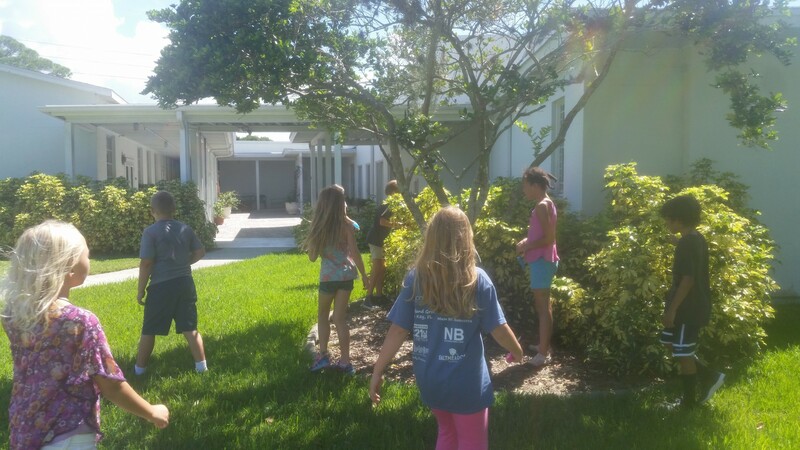 Putting our knowledge of cardinal directions to the test with a treasure hunt with various clues hidden around campus. The Saltmeadow teachers and students are off to a great start this September. We have welcomed back Ms. Yolanda and Frau Mienhardt, as they lead the way in the foundational skills of language arts and math concepts. Miss Liz has returned to teach drama, and has expanded her role to include science and dance, as well. We are very grateful to Mrs. McMillan for joining us again for handwork. Miss Chelsea returns to teach art, a favorite class. We are also very happy to introduce Mr. Gater for guitar and Mr. Chuck for woodworking and 4-H. We also welcome new students to Saltmeadow, who have swiftly become our good friends. This month the Saltmeadow students have been working diligently on the latest edition of The Tortoise Times in Ms. Yolanda’s Journalism class. They are creating detailed cosplay costumes with Mrs. McMillan in handwork. 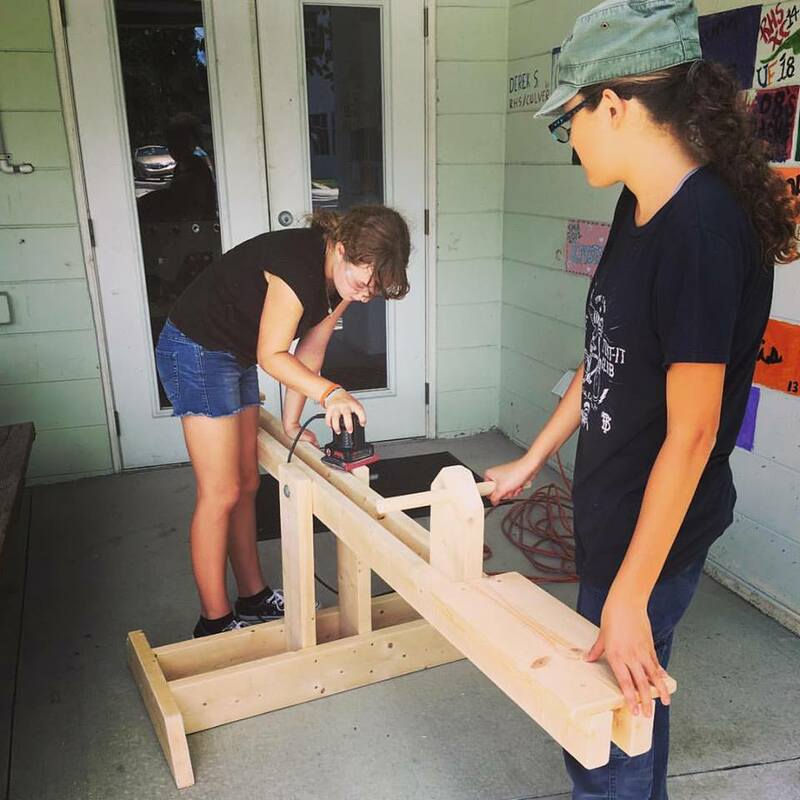 They built a beautiful wooden see-saw for the early childhood and wood boxes for the garden in woodworking class. They have chosen personal projects for Social Studies and have begun a bi-weekly meditation/yoga/fitness program. The first 4-H trip included a trip to Lido for snorkeling and dip-netting near the reef. The students are looking forward to taking part in the Autumn Equinox Festival play! As a service project and part of their woodworking class, the Saltmeadow students built a seesaw for the early childhood students at the Mangrove School of Sarasota. 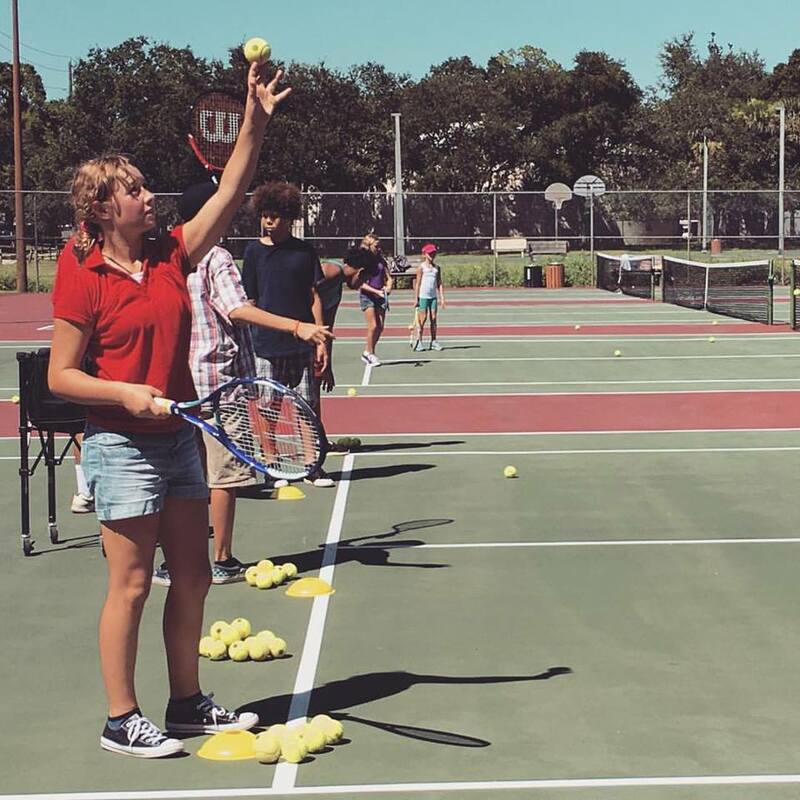 Our tennis block in full swing! Although we are only in week three, we have already been so graciously offered so much help with so many tasks in the community. Thank you all who have taken time out of your own day to lend a hand! Even the smallest hands can be quite helpful! 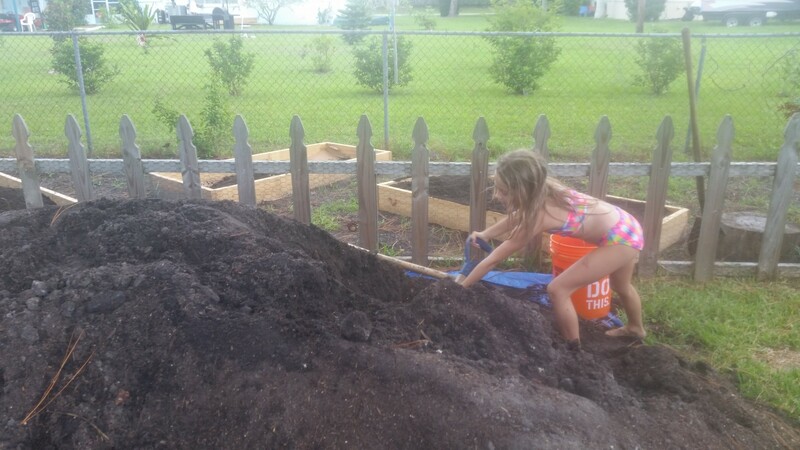 Fostering responsibility for our surroundings through chores. 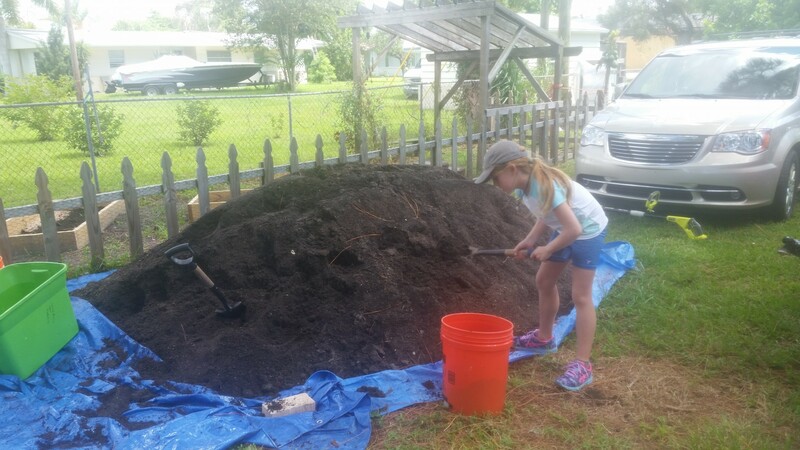 Here, one of our fourth graders is helping to fill our new garden beds! The focus of our first All-School Meeting of the year was to orient new families on many of our traditions, some new events we have coming up, and how important it is that everyone work together for the betterment of the community, and of course, our children. Each teacher offered an introduction to their class, and shared a few activities they have already completed. The vision of the school: We are building a school that honors childhood as a precious time – if this is where a child spends most of their day, most of the year, it should be enjoyable! We choose to not inundate them with facts, cramming in a bunch of information they cannot possibly digest, but rather draw out capacities and help build skills at the developmentally appropriate time. 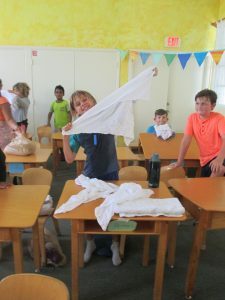 We follow the Waldorf curriculum for guidance regarding the child’s internal experience and meet them with this, as well as experiences that are therapeutic for all children – nature immersion, for example. We seek to help foster a balance between academic capacities, confidence in skills and activities, along with a strong sense of community. Helpfulness and kindness starts in our interactions with peers, and gets wider, to the community as a whole, to the local area, and then to the world, as they get older. We cannot expect peace on earth if students are conditioned to believe they are competing with everyone around them from the time they are young. The ultimate goal is well-rounded, balanced human beings who look out into the world and wonder, “How can I help?”. We don’t know what the world will be like in even 10 years from now. Fostering certain qualities in children – kindness, confidence, responsibility – these are things that will serve them throughout their lives. The next event coming up is the Giving Challenge, 2016, described above, here and here. We would love to have 100% participation of all families, teachers and staff. 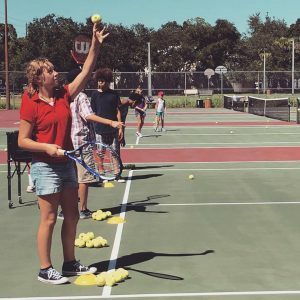 Please share the donation link with family and friends who would like to help contribute to your child’s education – not only are all donations matched 2:1 (new donors) or 1:1 (returning donors), but there is a 7 k grant for the non-profits with the most donors, regardless of donation size. Given the amount of dedicated parents we have here, we could actually win that! After this, we will celebrate with the Autumn Equinox festival, described above. We realize 7 am is very early, please do not feel pressured to come at that time. It is nice if you can make it, but it is also a nice morning potluck and play at 8:15 as well. A new twist on an old tradition comes in the form of Mermaid Faire – our antidote to rampant overstimulating and over-commercialized family events during the holiday season. Together we put on this festival and the magic your child will experience, yes, even older children, is truly priceless. We will need all hands on deck for this too. We all, together throw this event. From transforming the campus, preparing food, becoming an enchanting character, this event is 100% the hard work of parents and teachers. A handout was given with a list of the various activities as well as what type of help would be needed. You will be contacted as we put this together, to see how to best use your skill set. We understand that everyone has various obligations, there are many ways to help – it may be loaning props, preparing food, manning a booth – we can find something that works just right for you. Your children will beam with pride when they see you contributing. A separate event is the Local Artisan Outdoor Market, which is an adult evening of stress free shopping under the stars, with free childcare for children – they can make a gift for a loved one while parents mill about the outdoor market, browsing the various treasures just perfect for everyone on your list. 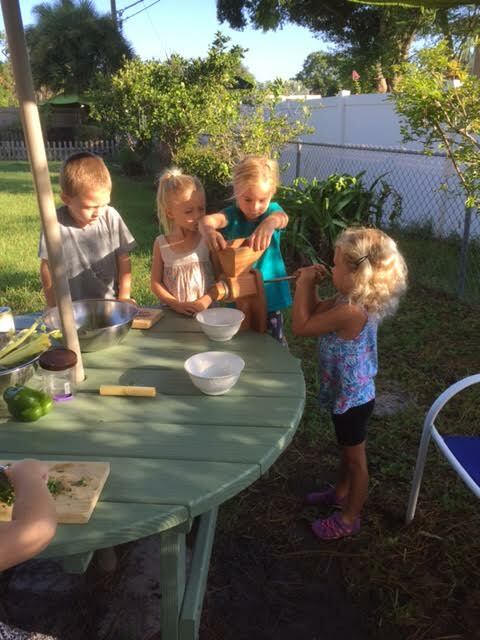 Under development: Our VPK program. Over the summer we began to take steps to make this program a reality for families with four year old children. We will keep you updated on the progress. Thank you all who were able to make it to the meeting. Together we can all make a tremendous difference for our children this year.